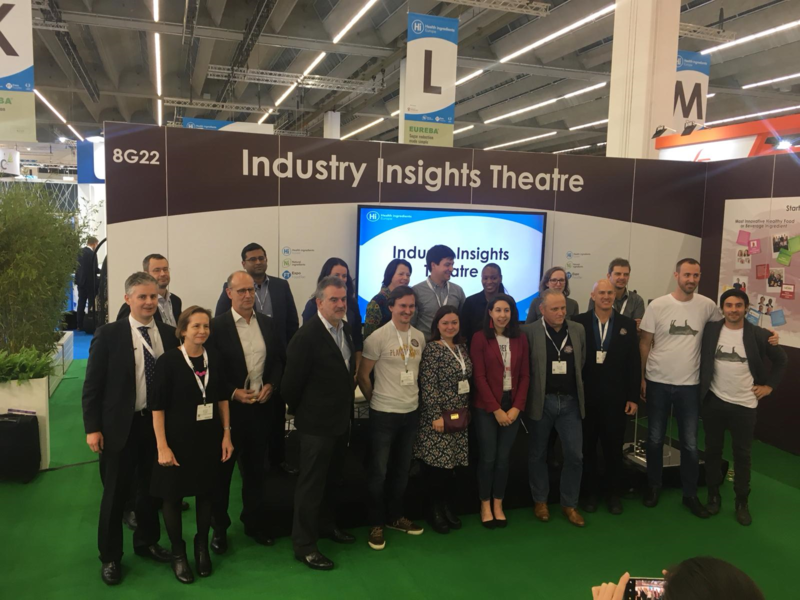 28 Nov 2018 --- GNUBiotics (Switzerland) has won the Ingredients category in the Startup Innovation Challenge at HiE 2018 in Frankfurt. The company is developing a novel platform for selective microbiota modulation, with an initial market focus on the pet food arena. A subsequent entrance is foreseen into the infant nutrition market. In human nutrition, potential can be seen in areas where you see the benefits of countering a deflated microbiota the most. With one-third of births in developed markets coming through Caesarean section, increasing data shows that these infants already have a deflated microbiota. This type of technology could close the gap. Better Juice (Israel) won the Tech or Service prize at HiE 2018, while Jet-Eat Printed Food (Israel) won the Plant-based finished products category at the event. Click to EnlargeStartup Innovation Challenge category winners. From left: GNUbiotics, Jet Eat and Better Juice. Now in its third year, the Fi Global Startup Innovation Challenge 2018 gave start-ups the opportunity to pitch their idea to the whole host of food & beverage industry players that make up the show’s 500+ exhibitors and 10,000+ attendees. The quality of this year’s event was strong, with an initial long list of 35 entries trimmed to a shortlist of 13, who were given the opportunity to pitch at this year’s event. • Most Innovative Healthy Food or Beverage Ingredient. • Most Innovative Plant-Based Finished Product. • Most Innovative Technology or Service Supporting F&B. The three winners will get individual advice from one of the judges. In addition, the successful nominees can choose from various special prizes – from a fully equipped stand at Hi Europe or Fi Europe; a marketing campaign within the Ingredients Network; access to the "Conciergerie" innovation platform from Presans; or intensive consultation with Wageningen University & Research. In addition to the three category winners, one start-up was selected by Naturex Ingenium as their special prize winner. 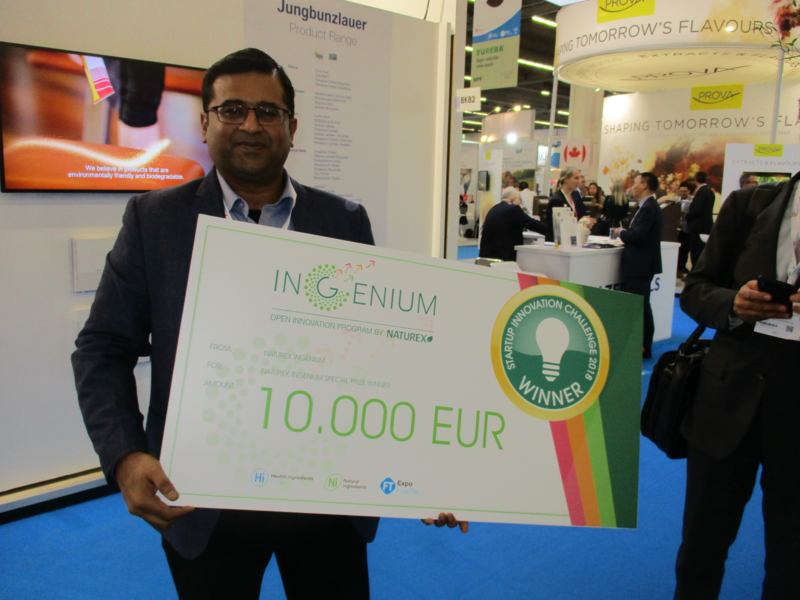 This startup won €10,000 plus a three month business mentorship with the Naturex Ingenium Open Innovation team. Magellan Life Sciences scooped this award for their brazzein sweetener production technology. A Swiss biotech created in September 2016, GNUbiotics Sciences is a privately funded company active in R&D to reproduce the natural diversity and complexity of unique structures found in mothers’ milk that are beneficial in preventing infections and the onset of diet-induced obesity. Building on exclusive rights from patents issued to Stanford University and their intellectual property (IP), the company is developing a novel platform for selective microbiota modulation via natural mechanism of action with next-generation Human Milk Oligosaccharides (HMOs) mimic composed of up to 130 diverse Microbiota Accessible Carbohydrates (MACs) structures. The company has a rich pipeline in nutrition (pet and infant) and later for medical food solutions. The short-term goal is to address the pet food market and hit the commercialization with a health ingredient in Europe in 2019. The initial focus will be on the US$100 billion pet food market [40 percent of which is in the US], which has a lot of similarities to the infant nutrition market because the buyer of the product is not the same as the consumer i.e., a parent will buy it for an infant, while an owner will buy it for a pet. following the award win. GNU 100, the company’s first pipeline candidate is an oligosaccharides and glyco-peptides mix that will be applied to the pet food market. It serves as a dense protective barrier on gut cell surfaces and help restore compromised gut microbiota to improve gut health. It is also claimed to offer protection from diet induced obesity by promoting short chain fatty acid (SCFA) production causing microbiota diversity increase which are often depleted during weight gain and the selective enhancement of a microbiota that is advantageous to calorie harvest. GNU100 is a natural derivative, animal origin fraction of a well known biosimilar in cardiology, manufactured using a unique and patented purification process (no enzyme, no GMO). GNUbiotics is working on nourishing and rebalancing the microbiota. “We are developing a complex sugar that selectively modulate your microbiota. Initial technologies are based on an exclusive Stanford patent. This complex sugar can go intact through the stomach and then you will reach the lower part of your digestive tract. There it serves first on a layer protecting the mucosa from pathogens and it will also feed the microbiota,” he says. Part of the reason for the award win was the jury's strong belief in the experience of the team behind the technology, a clarity in business strategy and a clear value-added proposition as a whole. The GNUbiotics team consists of executives from the nutrition and pharma industries, including Kunz himself, who has a consumer marketing background. Time to market and regulatory approval spawned the initial focus on pet food. He noted that if the pet food part of the business is successful it could be spun off. “The human side has tremendous potential, in the infant nutrition side but in many areas. The exit would be more about creating value on the human side. Most of our investors came to us for the human side. But the risk of manufacturing, regulatory and short term revenue for biotech made pet food a good short term goal,” Kunz explained. When asked by FoodIngredientsFirst, Kunz noted a clear gap in the market for digestive health products for pets, while weight management products may also hold potential in this area. “Today there are two widely used products in pet food. Fructooligosaccharides (FOS) is a simple ingredient coming from chicory. There are some benefits from L-Carnitine, which is another ingredient that could support gut health in animal nutrition. But today, the need is clearly there as one-third of pets have digestive health problems due to the use of dried foods that is not natural for pets. As a consequence of that lifestyle, they are now facing an obesity type of issues,” says Kunz. The company is now moving into manufacturing and scaling up. “We are running two FDA clinical trials to validate in cats and dogs in terms of dosage and we are going to register the product in the coming months and are looking at companies to take over the product distribution,” he explains. The human nutrition pathway is further down the line. “We have proven efficacy of the compound in selectively modulated microbiota and know how to measure this. Because we provide a gamechanger in terms of diversity, we believe that we will be offering the next generation of HMOs. Lastly, what we are producing is a natural source and will remain on the safe side,” Kunz says. The company has a lot of data in vitro, have some early data in mice and rats and now need to transfer this into humans. “But the logic for our business model will remain the same. We must maintain a high quality sourcing on the raw material side and transfer our technology to a leading producer who can manufacture in very large quantities and then we will be able to work with distributors, to sell a large quantities to manufacturers,” he explains. The focus will be on areas across human nutrition where the benefits of countering a deflated microbiota is most clear cut. 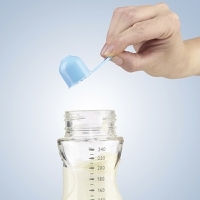 While he stresses that breastfeeding should always be seen as best, there is clear potential in the infant formula space for mothers for whom this is not/not always possible. “The initial target market will be starter formula of 0-6 months, which is where you will benefit the most, if not breastfed. But moving forward, prebiotics are already used in formula for above 12 months. Moving to an older age, when used together with vitamins it can play a role in immunity too. When children go to school or kindergarten they are exposed to more pathogens and this could be more useful. But in reality, when we are moving to older ages in will be more about treating gut inflammation and meeting a medical need,” Kunz notes. Better Juice (Israel) won the Tech or Service prize at the Startup Innovation Challenge. Better Juice Ltd. has developed innovative technology to reduce the load of simple sugars in orange juice. The patent-pending enzymatic technology uses all-natural ingredients to convert monosaccharides and disaccharides (fructose, glucose, and sucrose) into prebiotic and other non-digestible fibers and sugars, while maintaining the juicy flavor of the beverage. following the company's award win. Popular juices, such as orange juice and apple juice, have nearly 1 oz. (25g) of sugar per 1-cup serving (250ml). Although juice contains the vitamins and minerals you’d find in fresh produce, it’s devoid of most of the natural dietary fiber as an outcome of traditional methods of juicing. In addition to its intrinsic health benefits, fiber also adds to the feeling of fullness. Better Juice conducted several trials with different beverage companies and succeeded in reducing sugars in orange juice from 30 percent, up to 80 percent. The start-up can now provide proof of concept for orange juice. Mono-and disaccharides often called “simple sugars” are easy for the body to digest and thus quickly metabolized, the company explains. If the energy they provide can’t be used, it is converted to fat and stored. But when these individual sugar molecules link up, they become prebiotic fibers that are non-digestible. The shorter of these fibers, called oligosaccharides, are still sweet yet have been shown to bestow a number of health benefits, from protecting against disease to helping manage weight. There are other natural monosaccharides that are not easily digested. These sugars have no glycemic index and low caloric values. Eran Blachinsky, Founder & CEO notes strong product potential to FoodIngredientsFirst. “It is suitable for any type of juice. We did experiments with apple and orange, but it can be used with any natural source of sugar. We are now working with honey and maple syrup, but it can be done to any type of juice or sugary product,” he explains. In terms of the product development, they are currently selling the device to juice producers, so they can offer an alternative sugar reduced juice. “They can sell it as a juice or to other industries as a raw material, such as jams,” he adds. “We are just one year into development. We hope that by the end of 2019 or beginning of 2020 we will be on the market. The company will market an advanced device with the unique technology to fruit juice producers and, eventually, to cafes and restaurants,” he adds. In terms of reduction, sweetness issues will need to be considered. “We have managed to reduce the sugar in a juice by as much as 87 percent. The sweetness can be upheld if you restore back the sweetness as this goes back dramatically. If you only reduce by only 30 percent it still tastes good, as the dietary fibers and some other components have sweetness as it is not like you are deleting 30 percent of the sweetness by reducing 30 percent of the sugar,” he explains. There may be some labeling issues, he admits, however, particularly in EU markets, where such products can no longer be labeled as “juice.” “It is a processing aid, so in the US for example, you can call the final product an ‘enzymatically treated juice,’ for example. In Europe and Israel, you cannot call it juice any more as you have changed the composition of the sugars. We will be able to call it a ‘fruit product’ or a ‘100 percent fruit,’ but not a juice. It is a marketing issue rather than a regulatory issue,” he confirms. Jet-Eat Printed Food (Israel) won the Plant-based finished products category at the event. Jet-Eat is developing a new kind of animal-free meat (steaks, roasts and stews) with the same appearance, texture, flavor and cooking properties as animal meat, but from natural, sustainable and healthy ingredients. Click to EnlargeNominees and judges for this year's Startup Innovation Challenge. The company combines proprietary meat 3D modeling, food formulations and printing technology to develop a new category of complex-matrix meat alternatives in a scalable way. Their meat products will have 95 percent less environmental impact when compared to beef, zero cholesterol and be more affordable than beef. The unique approach and IP strategy will allow the company to offer a superior plant-based product, switching to hybrid (plant-based and clean meat) as new ingredients become available. The Jet-Eat multi-dimensional printing technology aims to lead a digital transformation of food development, production and distribution, helping to solve some of the biggest challenges in the current food system. Click to EnlargeAbhiram Dukkipati, CEO & Co-Founder of Magellan Life Sciences following the company's special prize win. Eshchar Ben-Shitrit confirms that the company is are already in discussions with chefs and butchers to test and showcase their products in different applications, but this will be private experiments for the next six to eight months. “Following that we intend to provide access to our products in foodservice, but mostly in order to expand the range of inputs for product improvement. Somewhere in the second half of 2020, our products will be rolled out more widely in restaurants and butchers who embrace the future of meat as being more than just an animal product. In the long term, we plan to be in retail having our industrial printers producing a wide range of fresh meat products with just-in-time production, almost zero waste, minor environmental impact and awesome consumer experience,” he concludes. Naturex Ingenium special prize winnerMagellan is a synthetic biology company developing novel platforms to produce plant-inspired molecules to address global health and wellness needs. Their leading molecule is a natural non-caloric protein sweetener called brazzein that is inspired by the scarce West African fruit Oubli. Magellan is positioned as the global leaders in developing a scalable and sustainable production for brazzein. “For us as a company this validates our thought process and belief that sugar reduction is a problem, that brazzein is one of the ideal solutions to address it and that our technology will enable that,” Abhiram Dukkipati, CEO & Co-Founder of Magellan Life Sciences tells FoodIngredientsFirst, after receiving the award. “We are 18 months from taking a product to market, which in the grand scheme of things is not really too long when compared to some other sweeteners out there. This is primarily because of the naturalness of the compound.” “This prize will help us in the filing of IP that are on the way and we will do a lot of travelling around for more marketing of brazzein,” he concludes. A detailed article on all the nominees can be found here.